Today is Day 6 of the Issie top pattern tour! Remember, until the end of the tour you can receive 10% off the purchase price of the Issie top by using code: ISSIERELEASE10. Don't forget you can also now purchase the pattern in Dutch and now also French!! I love that sewing and blogging has allowed me to 'meet' people from all around the world. If I ever have a few weeks to spare travelling Europe, I would have many people I would love to meet in person!! Today are four lovely ladies living in Denmark, Portugal, Germany and Jerusalem! Trine, Marta, Annika and Maarika have made some sensational Issie tops they are sharing today! They are all so different and also brilliant! First up is Maarika from Liivi & Liivi! I met Maarika when she helped me with testing the Dear Prudence dress a couple of years ago. Since then, I have been very lucky that she has sewn all of my pattern since! I love her style and she sews amazing things for all members of her family including herself and her husband. 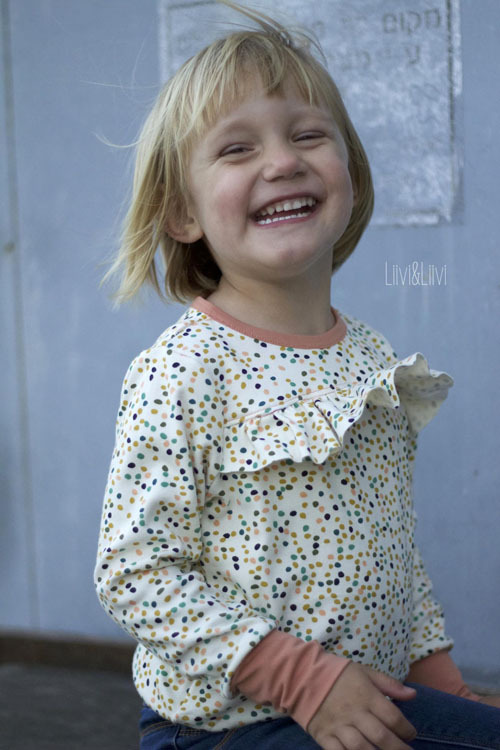 Her daughters are both adorable and her youngest looks so sweet in her new Issie top! If you don't already follow Maarika, you must! She will inspire you to sew!!! Next is Annika from Nah - connection. Annika has become a super star in Germany as she has cleverly translated many amazing English written patterns into German. She sells them in her shop and I have a few of my patterns there too. We both benefit from the clever arrangement! Annika has two children and is expecting her third very soon! She is a lovely lady and makes fantastic things! Apparently she is in the major good books with her daughter after adding this sweet apple applique to this lovely Nosh polka dotted Issie top with Rose collar! My girls would love it too!!! Head over to Nah-connection to see more! Thirdly is Marta from Do Guincho!!! I have known Marta since I released my very first sewing pattern and she is a fantastic lady! She is an architect, surfer, Mum and sewer! She lives in sunny Portugal with her husband and two daughters Ines and Teresa. Her girls are so sweet and are growing up so fast!!! I love how she added a lining to the ruffle so that a pop of fun peeks out from underneath! 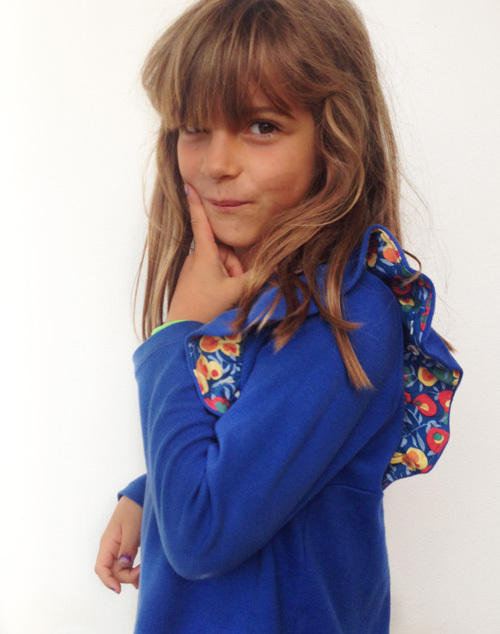 I've been told that Ines loves her new Issie top and I love it too!! See more over at Do Guincho! And last, but certainly not least, is Trine from Groovybaby and Mama! Trine sewed up the former Issie top - Little Betty when it was released a few years ago and is back today with Wilma, around four years later!!! Wilma is all grown up but lucky for me, she still fits into my size chart now that it has been extended to accommodate 12 years. Trine lives in Denmark with her husband and four children. Wilma is her youngest. She made some tweaks to the pattern, including some pretty cool sleeves and a really cool effect in exposing the raw edges of the neckline and ruffle seams! If you don't already know and follow Trine, you are in for a treat over at Groovybaby and Mama! Thank you so much Maarika, Annika, Marte and Trine! I really LOVE all of your tops!!! Come back next week to enjoy three more days of Issie top love! She is a stunted child.